Advantages: Exceedingly detailed story of the R-4360 "Corncob" and its aircraft derivatives via detailed text and photos; packed with good clear images; leaves no stone unturned! Billowing clouds of white smoke were driven rearward by seventeen-foot Curtiss electric props as our four 4360s came to life. It was twilight at the end of a sparkling 1967 Fall day in West Germany, and our 185,000 pound C-124C taxied out of the chalks, taking the active at Rhein Main Flugplatz. As we started our usual lumbering takeoff roll, the aircraft commander (A/C) called for max power, telling the flight engineer (FE) to follow him through on the throttles. The unbridled surge of the 3000 horsepower Pratt & Whitney R-4360 radials in concert was always a thrill to this boy hotrodder and engine builder, and I always loved to watch the orange glow of the exhaust pipes reflecting off the cowling and belching blue flame. As we slipped the surly bonds, the FE made the comforting call that all four torquemeters (measuring engine output) were pegged. As the runway fell away, I peeped out my small nav window at Number Two. Suddenly it started shotgun-like backfiring under the tremendous load, and sheets of orange flame spurted from the exhaust. The A/C and FE simultaneously pulled back the offending engine’s power, and the backfiring ceased. At that point “Ol’ Shakey” assumed its oft-uttered nickname, “World’s Largest Three-engined Airplane.” Although that certainly wasn’t the only time during the fifteen hundred hours I spent in the 124 that we caged one or more engines, the brilliant engineering and wondrous complexity of those twenty-eight cylinder radials always brought Bondo home safely. The specialty book “sky” lately seems to be raining large reference volumes on us modelers. Last month I reviewed Cal Taylor’s impressive history of the Douglas C-133. 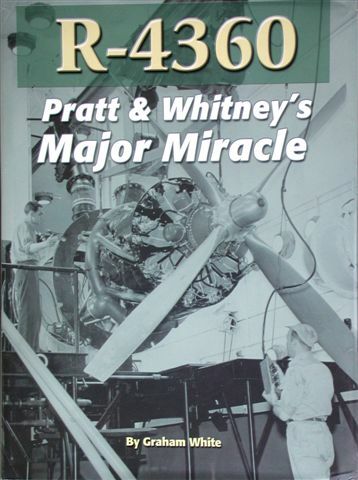 Now, noted powerplant author Graham White (“R-2800: Pratt & Whitney’s Dependable Masterpiece”) has upped the page count ante to over 600, exhaustively addressing P&W’s R-4360 “Wasp Major”, the largest, most powerful mass-produced reciprocating aircraft engine in U.S. history. This exceedingly detailed description of the design manufacture, testing, as well as military, civilian and racing applications of the P&W “corncob” radial, is as much or more than even the most rabid reciprocating engine fan could desire. White leaves no stone unturned, addressing in minute detail the design and manufacture of practically every component of this complicated powerplant. The sheer volume of photos and beautifully drawn illustrations, many plates in color, is simply overwhelming. Even though I’m an engine and machinery “nut”–who else but a machinery freak would get up at 6 A.M., as I did a day ago, to drive twenty miles into downtown Austin, Texas, to watch, up close and personal, a beautifully restored black Union Pacific 4-8-4 Fifties locomotive shoot clouds of steam from its cylinders as it hooked up to ten passenger cars full of rail fans and chugged northward to Arkansas--I still had to re-read and review much of the material to completely understand what was going on inside that thrashing radial. Especially requiring my undivided attention were the firing order design and crankshaft balancing considerations. OK, let’s level here; EVERYTHING required my attention, from the master rods to the link rods to the magneto drives to the cams to the injection carbureter to the various supercharging/turbocharging schemes to the torquemeters; it’s all there in bewildering profusion. Then, to top it all off, Mr. White devotes over two hundred pages to show every R-4360 airframe application known, from the B-50 to the XB-35 to the C-97 to the C-119 to the Martin Mercator to the B-36 to the C-124, not to mention F2G Corsairs and air racers like the converted Hawker Sea Fury, Dreadnought. These military applications are accompanied by, again, a wealth of pix and drawings showing in mind-numbing detail the integration of the R-4360 into the nacelle structure of each bird. Wonderful stuff! Near the book’s end, White includes reminiscences (such as changing a generator in flight, behind 5000 pounds of roaring radial) of C-124 aircrew members, and this brief trip into years long past brought it all back to this curmudgeon as if it were yesterday. As Jet Age technology spread slowly to the cargo side of the USAF in the mid-to-late Sixties, the days of the 4360 were decidedly numbered. And, what really put the final nail in the coffin of this outstanding-but-delicate powerplant was the very high price of rebuilding, costs so high that maintainers always preferred swapping out the whole engine, with accessories already installed, in a quick change “pod.” Slowly but surely most of the thousands of new engine spares in the system were used, forcing latter day restorers and air racers to put out the big bucks for overhauls. It’s been thirty-eight years since these engines were the heart of USAF heavy motive power, and their sounds, smells, dripping oil and vibration are still not forgotten by those of us who bet our lives on them every day. Fortunately, some factory demo, electric-powered R-4360 cutaway engines are on display in airpower museums, so that engine “junkies” like me can still watch the complicated interaction of the reciprocating components, gearing and superchargers. Graham White’s remarkable work has rendered a valuable service to the study and knowledge of these important adjuncts of aircraft history; I highly recommend it.